The large, reflective glass doors on the first floor of the Mass Communication Building mark the entrance to a pioneering space designed as an outlet for student media and state-of-the-art instruction. It’s MTSU’s new Center for Innovation in Media. Upon entering these doors, it’s difficult not to gawk at the state-of-the-art equipment and technology featured in every visible space. In the open, central area, known as “the egg,” rows of sparkling iMac computers equipped with the latest programs in design, video, audio and print editing are perched side-by-side. The walls boast large flat-screen television monitors, providing “windows to the outside world” since they are tuned to national and global news stations. Behind doors on either side of the entrance is radio’s realm. One door opens into Studio B, dedicated to WMOT, Murfreesboro’s public radio station. The other leads to Studio A, home to WMTS, the student-operated station. Both studios feature the latest in recording-industry equipment, from the swiveling display monitors to the deluxe switchboards. Branching off from “the egg” are hallways leading to several equally impressive areas. 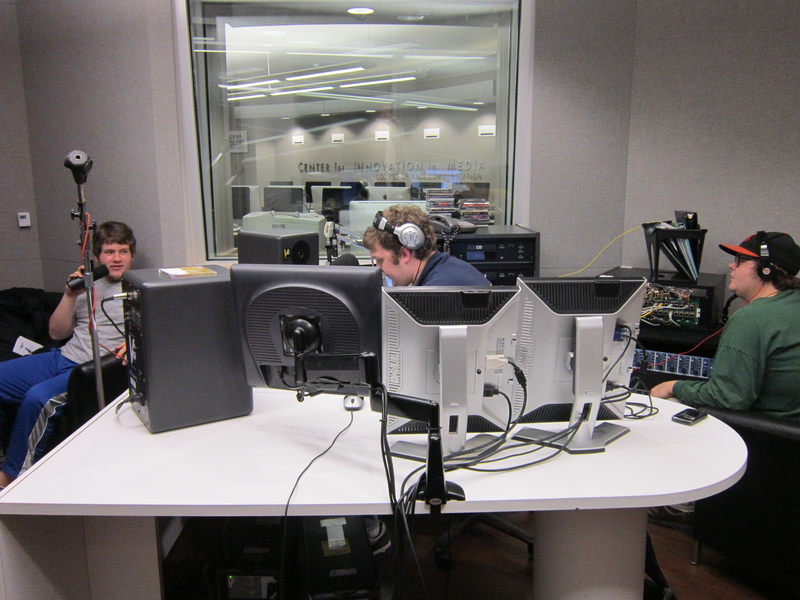 The virtual newsroom, also known as the “green room” for its floor-to-ceiling coloring, serves as the production lab for MT10HD’s newscasts. Its robotics technology and visual-effects capability rival and in many instances exceed that of a professional news station. Other rooms in the center include the “smart classroom,” where classes and group work are enhanced by robotics and computer technology, and the conference room where student-media representatives meet each morning to discuss their ideas, plans and objectives for the day and future. Sidelines, MT Records, WMOT, WMTS and MT10HD all have a place here, and their proximity to each other means they share ideas, inspiration and creative energy. Before the new center officially opened last April, MTSU’s mainstream media platforms resided in separate corners of the campus, working alone to research and develop their print, television and radio productions. Here, these media platforms converge and collaborate, giving students the opportunity to forge relationships with organizations and like-minded individuals, as well as be exposed to the technology and operation of specific fields, which is essential in preparation for the professional world. 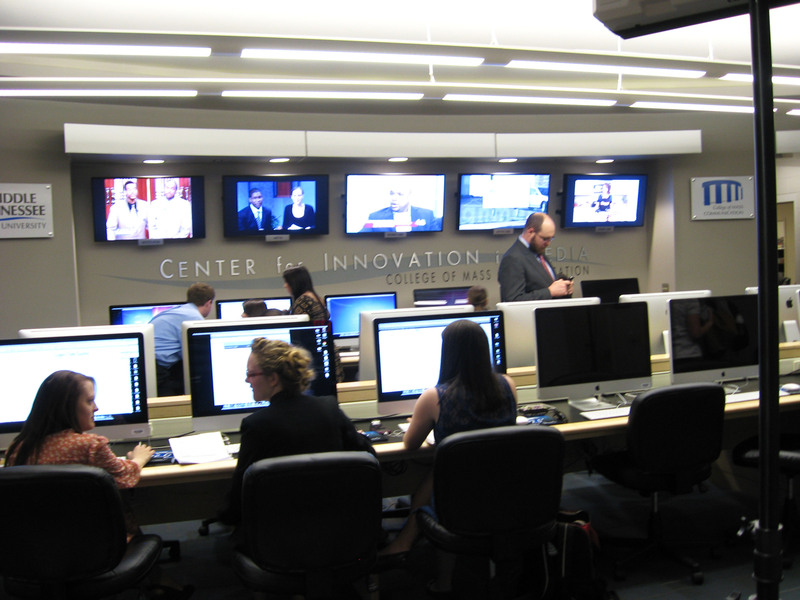 Since the opening of the center, student media has experienced an upsurge in involvement. Foust has further hopes that the center will inspire partnerships between other departments of MTSU, just as it has inspired those in the building. “For a first semester open in business, we’re really pleased,” he said. Written by Noel S. Heath, a PR major, while a student in Sharon Fitzgerald’s media writing class.